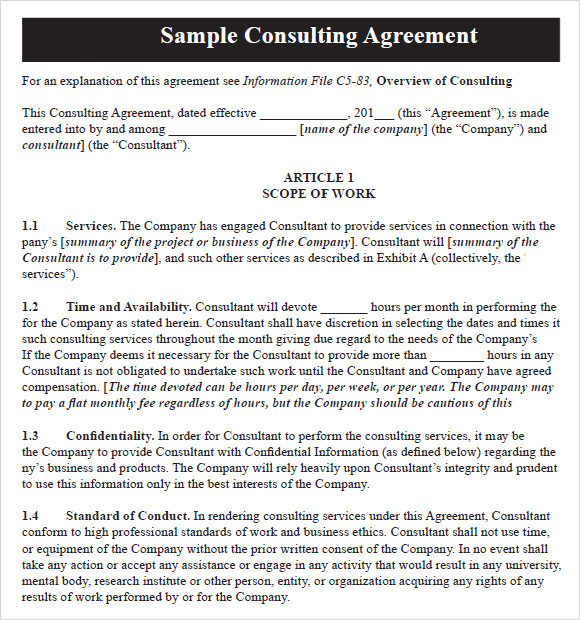 Consulting agreement is a legal agreement between a Consultant and Client. It takes place whenever a client buys services of a consultant. 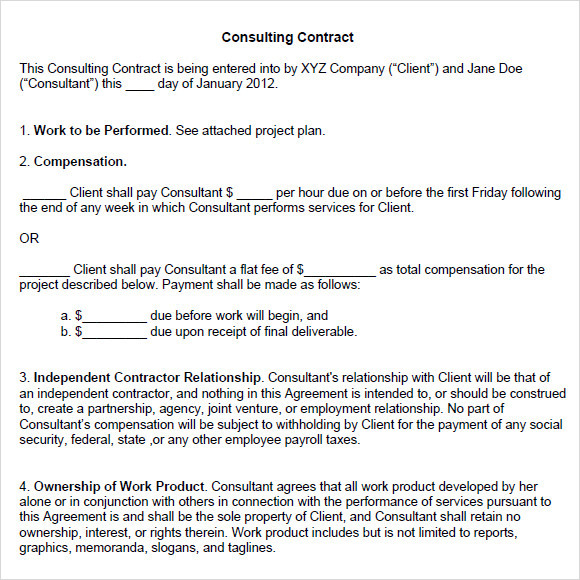 General consultancy, Web based consultancy are examples of such an Contract Agreement Template. It specifies the nature of consultancy, fees, responsibility of the client as well as the consultant. Various kinds of services fall under the general term of ‘Consultancy’. 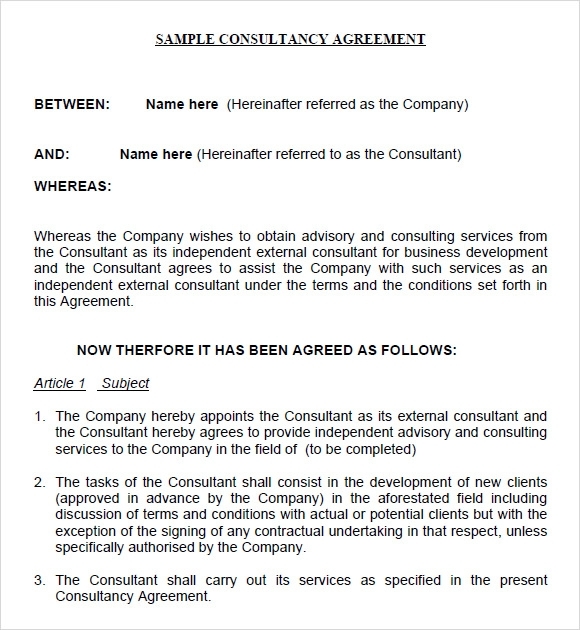 This consulting agreement template serves as a sample to show the consultancy agreement between 2 firms who shall be referred to as the company and the consultant. Then it goes on to show what the company exactly desires from the consultant, which in this case are, advisory and consulting services in the field of business development. 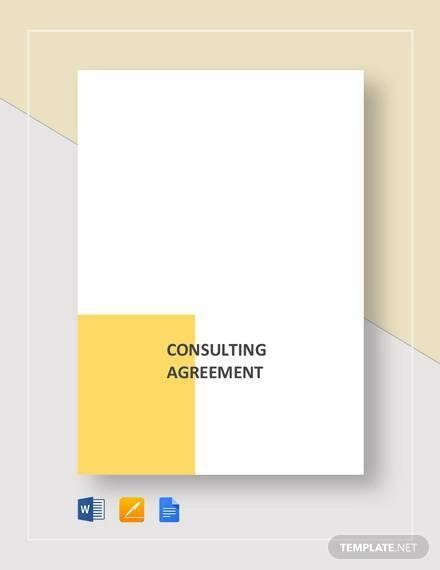 This consulting agreement template is available for free. 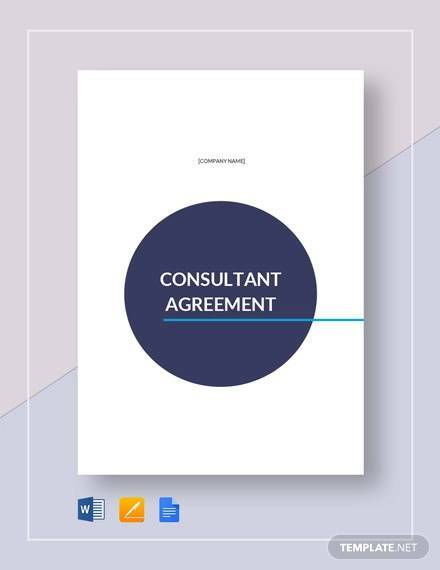 The template shows and comprehensively detailed consulting agreement which can be used as an example to understand the basics of consulting agreements. Firstly, it has the date from which the agreement comes into effect. Then it shows the details of the companies involved in the agreement. Then it goes on to show the terms of the agreement which include details on the services to be provided, expenses that might be incurred, payment for the services provided, interest details on overdue payments and most importantly the term of the agreement. 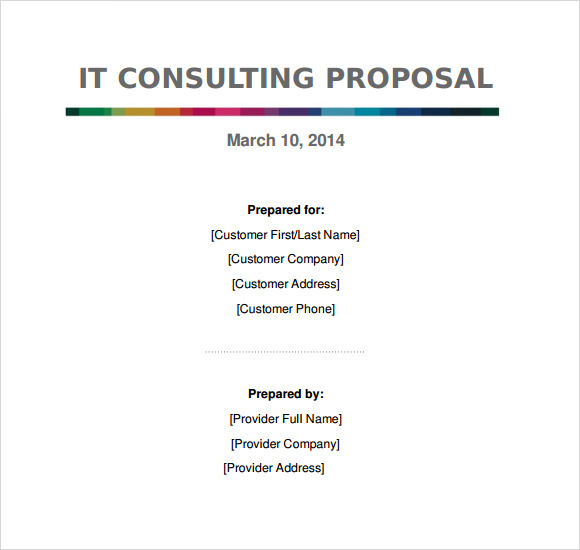 This is full – fledged consulting agreement that is ready to print. 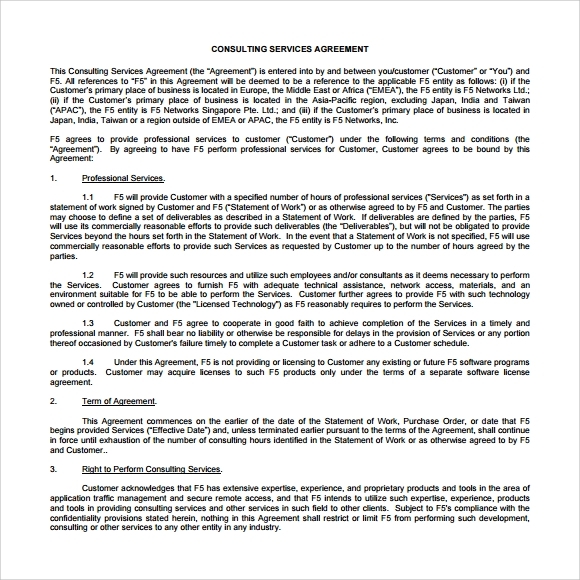 It includes all possible details regarding a consulting agreement between 2 parties namely the customer and F5. The clauses of the agreement are providing of professional services utilizing efficient employees who cooperate properly and also the fact that f5 won’t be licensing any of softwares. 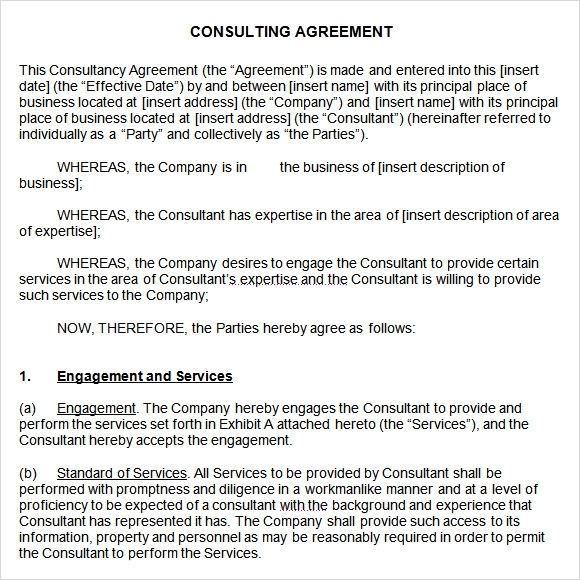 Then they move on to the terms of the contract, after which there is an acknowledgement section wherein the customer acknowledges F5’s right to perform consulting services. 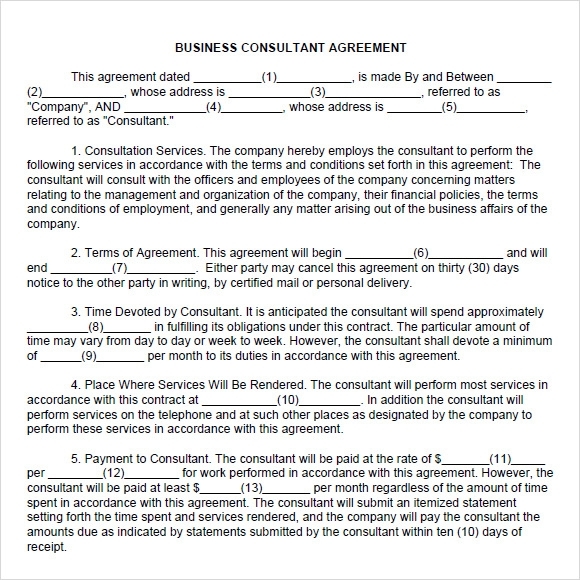 What are Consulting Agreement Templates? Consultants are basically trained professional who earn their bread and butter by providing expert advice in their field of expertise. They happen to be storehouses of knowledge and information and they exchange the information for remuneration. 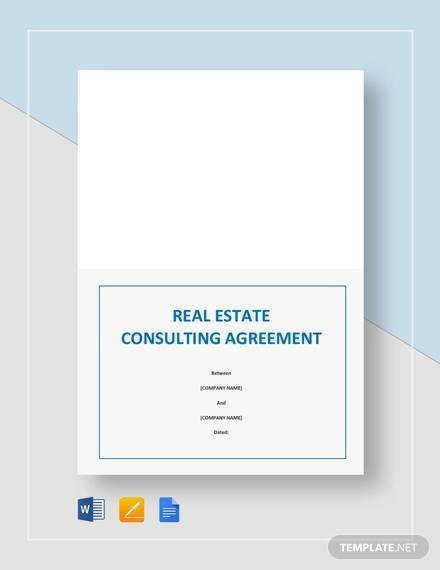 Consulting agreements are the agreements which consultants enter into so as to perform their duty of advising people and earning some remuneration out of it. As the name suggests, consulting agreements are agreements, so they compulsorily contain a lot of terms and conditions, to which both the parties (who are subject to the agreement) must comply. 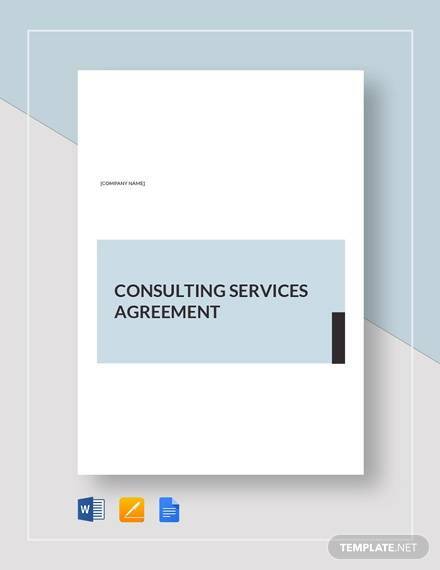 A consulting agreement template is nothing but a digitised form a consulting agreement, available in soft copies.You can also see Business Consulting Agreements. 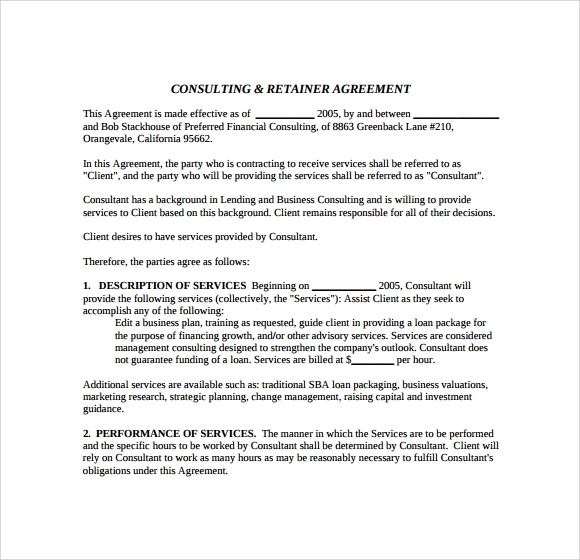 What Are The Benefits Of Using Consulting Agreement Templates? It helps in clearly defining the scope of your tasks. It serves as a legal document. It works as an excellent marketing tool as well. It helps in identifying the client’s expectations. It helps in establishing good working relationships. 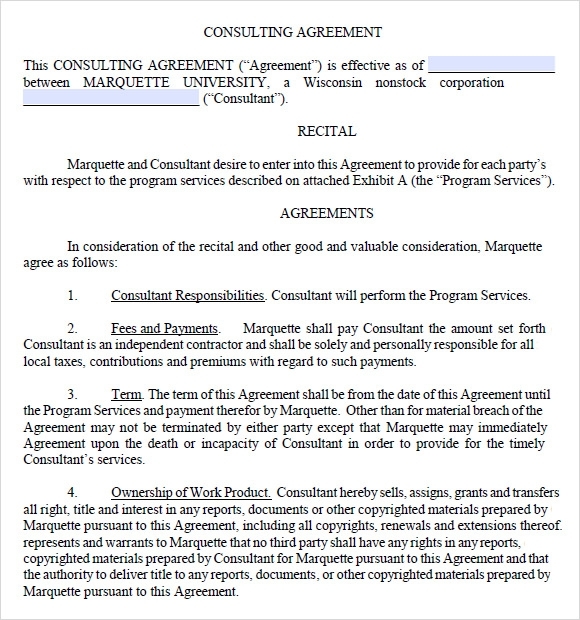 How To Prepare A Consulting Agreement Templates? A consulting agreement cannot be prepared by anyone and everyone. You must be a consultant to be able to prepare one. For consults, it is an extremely easy thing to do. Just jot down the services you are willing to offer, specify the time period for which you shall be providing those services, and the remuneration you expect in return. That’s it. Now all you need to do is get a client and you’re good to go. The treatment of intellectual property is a very arguable issue in such cases. Therefore, one should be cautious while drafting a Consulting Agreement. 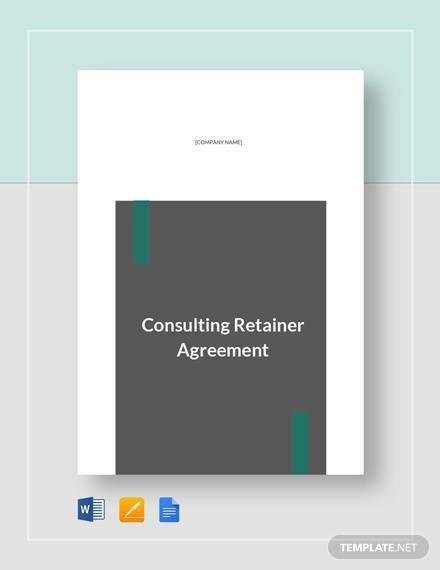 We have a variety of samples of Consulting Agreement templates which can be downloaded for free and can be customized and edited across all formats, thus making your documentation easy. 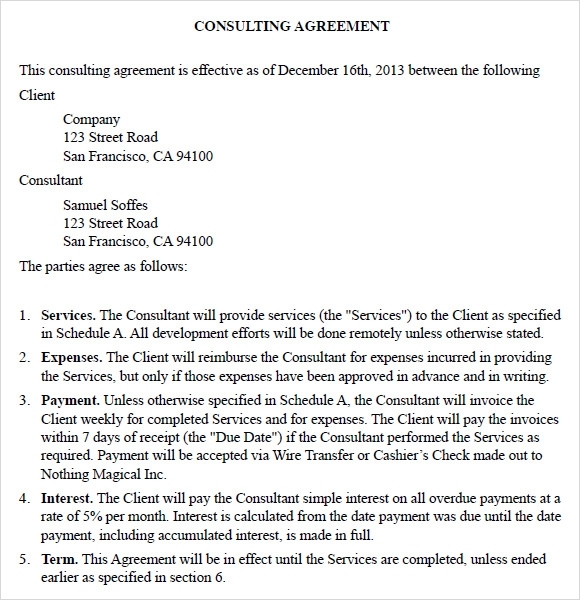 You can also see Sample Consulting Service Agreements.